We’re still in the middle stretch of Arrow Season 5, and so long as writers still withhold the Prometheus card, “The Sin-Eater” and last week’s “Spectre of the Gun” offer solid contrast on the best way to burn off an hour. Last week offered an intriguing, if heavy-handed focus on a singular topic like gun control, where tonight felt more like a confluence of shiny character returns to paper over the fact that “The Sin-Eater” had only so many pieces to maneuver for the main story. 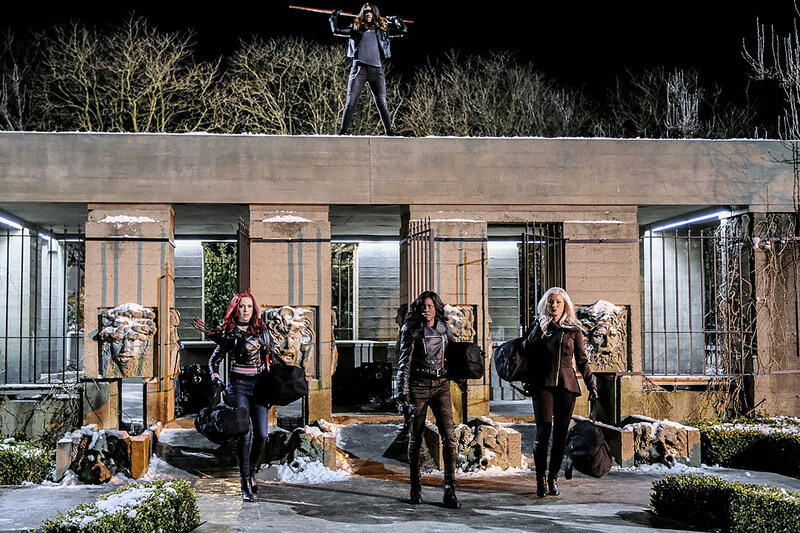 On the one hand, it was smart to bring together a coalition of recurring characters like China White (Kelly Hu), Cupid (Amy Gumenick) and Liza Warner (Rutina Wesley), as neither could necessarily carry their own episode at such a crucial juncture for the season. What’s strange is that the least-recurring Warner was the only villain whose history ended up woven into the plot; with the added stretch of invoking Quentin’s partnership with Darhk last year at a time the character has moved onto vastly different issues. The hour’s running theme had one character taking on the sins of another (though really, when is guilt not the show’s most prevalent device), and neither Warner nor her compatriots felt like the best representation of that. An album cover with a dynamite vocalist, on the other hand. Such a half-baked plot driver wasn’t nearly so interesting as the threads it danced around anyway, like Oliver’s genuine conundrum at Susan potentially uncovering his secret identity, or the extremes Felicity and Thea went to handle it.I’m less inclined to buy any more of the SCPD turning against Oliver, and I’d doubt it the writers have the clearest handle on whether Susan represents an earnest reporter, or someone wrapped up in all the Russian intrigue, but I do appreciate that Thea’s manipulations ended up an echo of her mother (we miss you, Moira). The conflict between Oliver and Thea didn’t quite resolve by the hour’s end, but nonetheless garnered some intense performances from Stephen Amell and Willa Holland; keeping Lance engaged emotionally as well. *We all know the flashbacks only move a few paces in any given hour, but have they ever so blatantly left things unfinished, as to have Anatoly at gunpoint be the last thing we see? 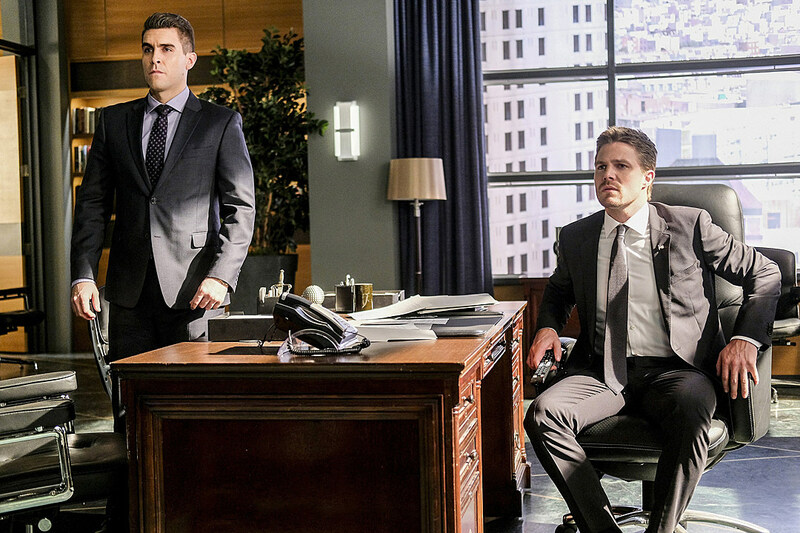 Season 5 could definitely stand to start tipping some of its dominoes, between Adrian Chase, Prometheus, Vigilante or anyone else dancing around this arc, and hopefully the scandal of Oliver covering up Billy’s death will facilitate that, if not bring a climactic end to his Mayoral tenure. It’s a bit late in the year to get hung up on smaller beats like Dinah’s uncertainty at taking up the Black Canary mantle, or whatever random criminals want to take over Star City this week. I’m sure you could draw a parallel between Prometheus’ mother refusing to destroy her son’s life, and Thea so cavalierly blowing up Susan,’s but come on, lady. Just give a name, or point the dang Mayor toward your serial killer offspring. Kind of disappointed we didn’t get to see Arrow go all Eastern Promises on Gregor in a bathhouse. I mean … you know what I mean. Hey, Oliver has a fancy wrist thingy. And Curtis has a distracting new costume. With … red boots? Not the best action cuts or blocking this week, but neat fire-bow! Still picking up some weird Quentin-Thea vibes, as well as Diggle-Dinah. Arrow Season 5 will return next Wednesday with “Fighting Fire With Fire,” airing at 8:00 P.M. on The CW.